Asia has more billionaires than any other continent, a survey by a China-based wealth magazine showed on Thursday, apparently overtaking North America for the first time. There were 1,453 people around the world with a personal wealth of $1 billion or more as of January, said the Hurun Report, a luxury magazine publisher that compiled the list. Asia had 608 billionaires, North America 440 and Europe 324, it said in a statement. It is believed to be the first time Asia has been named as home of the largest proportion of super-rich on any global list. US business magazine Forbes said in its most recent international rich list, published in March last year, that the Asia-Pacific region had 315 billionaires, compared to 450 from North America and 310 in Europe. 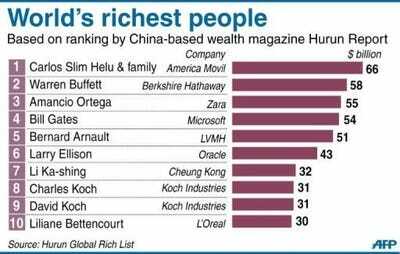 Among individual countries, the United States and China dominated the Hurun list, with 408 and 317 billionaires respectively, followed by Russia, Germany and India. Mexican telecoms czar Carlos Slim, 73, was ranked as the “Richest Man on the Planet” with a personal fortune of $66 billion. Slim also topped last year’s Forbes global list. US investor Warren Buffett and Amancio Ortega of Spain, founder of fashion brand Zara, were second and third in the Hurun Report rankings, with a net worth of $58 billion and $55 billion respectively. Hong Kong investor Li Ka-shing kept his title of Asia’s richest man with $32 billion, the seventh wealthiest person in the world. “In China we’ve seen a huge urbanisation boom and that has created a lot of wealth in property,” Rupert Hoogewerf, chairman and chief researcher of the Hurun Report, told AFP. Zong Qinghou, who heads soft-drink producer Wahaha, and Wang Jianlin of property developer Wanda were the only two from mainland China to make it into the top 100. The Hurun Report estimated the total wealth of the world’s dollar billionaires at $5.5 trillion, roughly the size of the Japanese economy last year. “This past year has seen a rebound in the wealth of the private sector,” it said, adding the net assets of the 10 richest people on the list rose 22 per cent over the year, or $250 million a day. Real estate, telecommunications, media and technology and retail were the most common sources of wealth, it added. Moscow has more billionaires than any other city in the world with 76, it said, edging out New York, Hong Kong, Beijing and London. Hoogewerf said the true number of billionaires in the world could be three times higher as some super-rich hid their worth. Hoogewerf, an accountant by training, previously compiled the Forbes rich list. He said the survey methods included examining public information such as stock market reports, scouring artwork purchase records and tracking down philanthropical activities.